Situated on a river, this spa resort is 0.4 mi (0.6 km) from Sanctuaire Notre-Dame d'Etchemin and 2.4 mi (3.9 km) from Omega Park. 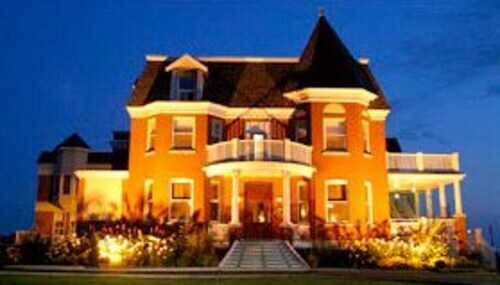 Lieu historique national du Canada du Manoir-Papineau and Manoir-Papineau National Historic Site are also within 10 minutes. 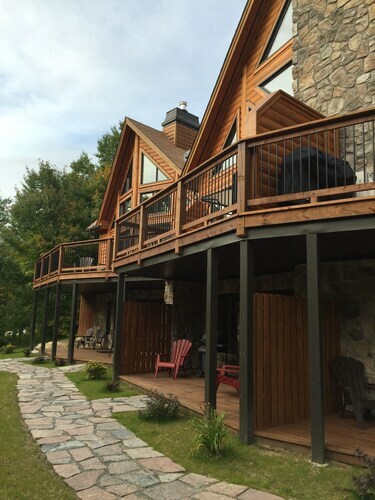 Situated on a lake, this chalet is within 16 mi (25 km) of Alaskan Adventure Tremblant, Đại Tòng Lâm Tam Bảo Sơn, and La Conception Park. Scandinave Spa Mont-Tremblant and Aventures Neige are also within 20 mi (32 km). 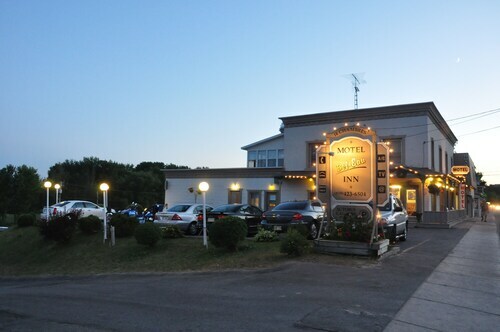 Located in the heart of Montebello, this hotel is 0.5 mi (0.7 km) from Lieu historique national du Canada du Manoir-Papineau and 3.1 mi (4.9 km) from Omega Park. Sanctuaire Notre-Dame d'Etchemin and Manoir-Papineau National Historic Site are also within 1 mi (2 km). 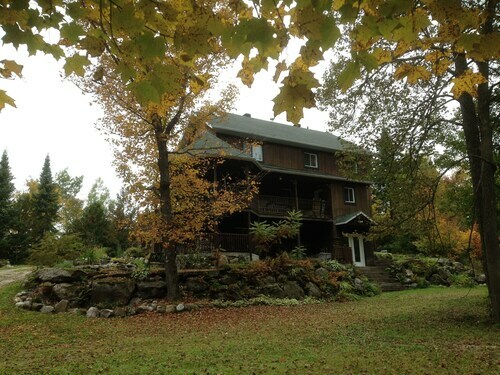 Situated in a rural location, this bed & breakfast is 0.1 mi (0.1 km) from Papineau-Labelle Wildlife Reserve and within 20 mi (32 km) of Pimatina Park and South Lake Gagnon Beach. Parc du Mont-Carmel and Nominingue Golf Club are also within 25 mi (40 km). How Much is a Hotel Room in Lac-Simon? Hotels in Lac-Simon start at C$85 per night. Prices and availability subject to change. Additional terms may apply. Pack your bags—it’s time to embark on a getaway. Whether you’re craving a solo retreat or promising your family a vacation to remember, book one of the best hotels in Lac-Simon. These hotels are located within easy access of the city’s hottest attractions and entertainment, so you won’t miss a beat while you’re in town. Spend the days exploring the local landmarks and the evenings getting to know the nightlife. After exploring the city from top to bottom, rest up at a hotel that speaks to you. Find the perfect place that matches your trip’s vibe, from a trendy boutique to family-friendly accommodations. Allow us here at Travelocity to pair you with up Lac-Simon hotels that suit your vacation preferences. Discover places with convenient on-site restaurants, around-the-clock service, and pools where your kids can make a splash. Some hotels may boast fitness rooms and spa services, while others feature game rooms and Wi-Fi access. To top it all off, you’ll score cheap hotels in Lac-Simon that let you spend more on your activities and less on your lodging. Book and bundle your flight and hotel deals together today and save up to $537. It’s time to explore a new city, and break out of your routine. The house was super tidy and the location is amazing. The hot tub is fantastic. The rooms are super cozy. 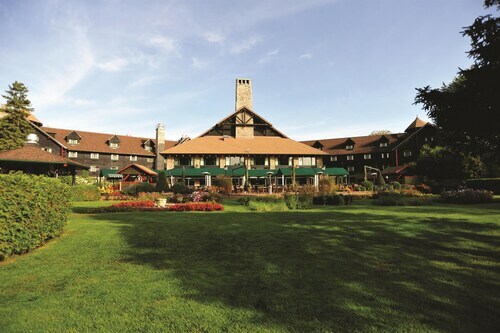 This place is not too far not to close to Tremblant which was perfect for us. Loved it !! Exceptionally clean and quiet. Convenient location for access to the Kenauk trails. Nice people. Refreshingly unique, especially if you're tired of chain hotels. This is a fantastic place to spend time away from work and noise. It is a retreat in every sense of the word. However, it lacks family oriented activities. Aside from the indoor/outdoor pools and hot tubs, we didn't find much things to do. They can do alot to improve on family activities. We even found it difficult and confusing to get information on what is happening and when. The food is exceptional, Outdoor BBQ is perfect and the breakfast buffet mouth watering good. All ingredients are fresh and top quality, hats off to the chef for an amazing cooking. The rooms are tidy bit small, but comfy. Bathrooms are small, but you've got plenty of towels and anything you want in a room is there. The theme of this resort is a log cabin, so expect everything to be dated and look like a cabin style. The staff were very friendly and helpful, but they lack knowledge about activities in the hotel. The river view is breath taking and a true escape. I can see this resort ideal for couples and seniors but may not be very fulfilling for families.